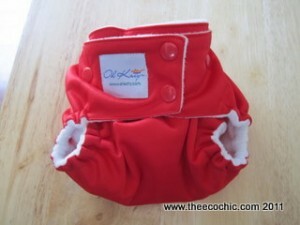 Have you heard of Oh Katy cloth diapers yet? 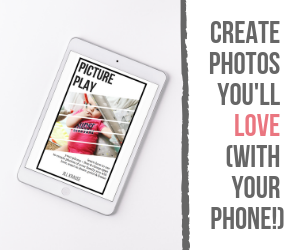 We received ours a few months ago shortly after I met the owner Katie at the spring ABC Kids Expo. Katie had a very modern and hit booth at the ABC expo and her personality was adorable. She was very personable and the one word that keeps coming to mind is “cute” – she just had that trendy, sweet, and cute feel about her. 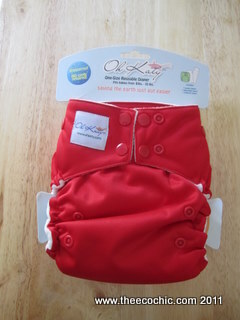 The Oh Katy diaper is a one-sized (8-35lbs) pocket diaper that is very similar to what you may already be familiar with (as compared to other pocket style diapers). It does have some unique characteristics that stand out to me. Front opening pocket – only a few brands are moving the pocket to the front. Depends on the day if I like it or not – where does your little one’s poop end up? Front or back? Micro-fleece lining – very common actually but I prefer it to the suede cloth linings. 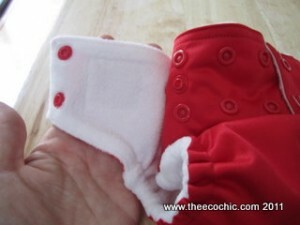 Newborn hip snaps – prevents wing droop! 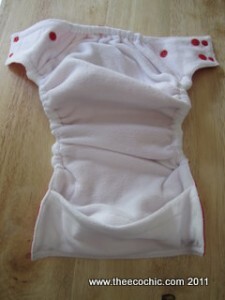 A must have if you have a small newborn or skinny toddler. TPU – it’s a heat bonding process for PUL that is safer for the environment than traditional PUL bonding with chemicals. This is a similar process that Rump-a-rooz uses for their diapers. Earth friendly packaging which can be easily recycled with your cardboard recycling program. While we’ve only used our Oh Katy a handful of times (thanks to our never-ending potty training that still isn’t finished) but we’ve been very happy with the fit and the quality of this diaper. The current stock of the Oh Katy line is limited until next month (Sept 2011) – I wonder if Katie will be releasing anything new at the ABC Kids Expo?! We’ll just have to wait and see! Buy It Now: You can purchase Oh Katy directly from the Oh Katy website or at fine cloth diaper retailers like Kelly’s Closet. Retails for $17.97 each. These are rather inexpensive compared to other cloth diaper brands, will give these a whirl.